A couple of years ago, Death and Company (Death & Co) was on a list of best bars in the United States. My friends and I checked it out for our friend's birthday. Death & Co is probably one of the most famous speakeasys in New York City. As a result, there is always a line/long wait. You can't make a reservation ahead of time. The only way to get on the list is by going up to the door. They will take your name and phone number and call you when a table is available, so you're free to go to another bar or restaurant in the area. ﻿There is a small menu of food available. We got the truffle fries ($8). 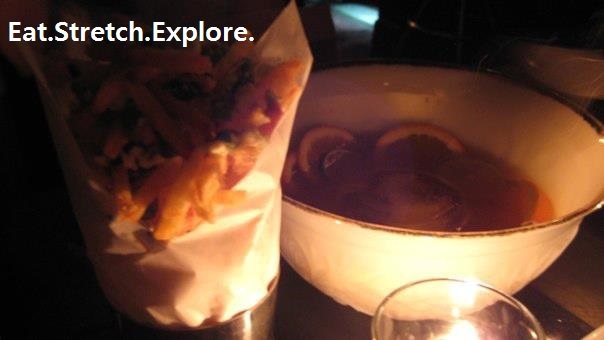 Truffle fries are always good. The fries are a thick-cut frites, so they are not super crispy. The fries were also not overly seasoned. Nothing worse than eating a fry completely drenched with truffle oil. One other time, we had the truffle macaroni ($10). I tried a little (because cheese) and it was delicious. I would definitely recommend trying this. It is served on individual spoons, so no awkward double scooping, etc. We also tried the wild mushroom tart ($12). This was pretty darn good, but I really like mushrooms. It is topped with an assortment of mushrooms and also caramelized onions and walnuts. The crust is very fluffy and was prepared very well. We got the punch bowl to share each time. Each time, the drinks are prepared well, decently strong, and not watered down, even with the iceberg in the bowl. There are three punch options and each is $46. To make your decision, just choose if you want a rum (Pic-O-De-Crop), bourbon (Chiquapin Parish Punch), or gin-based (Piccadilly) punch. I have tried the gin- and rum-based punches and each are equally delicious and well-balanced. It is just a question of what flavors you are in the mood for. Each of the punches has very fresh, citrus juices in it, which adds lightness to the drink. There are individual drinks available, roughly $15 each. They only serve specialty drinks that are pretty unique, in my opinion. Each drink has about 5 (or more) different flavors melding together. First off, you need to choose if you're in the mood for a gin, rum, tequila, whiskey, brandy, or champagne-based cocktail. If you're overwhelmed by the options, ask your server, they'll be able to help you out. The atmosphere inside is really cozy. It is dark...super dark. Like in order to read the menu I, because I am an old lady, used the table candle. The music is kind of loud for how small the space is, but not deafeningly-loud. There are probably booth/tables for around 25 people and there are bar stools for about 15 people. Because of the small atmosphere and few people allowed in at a time, the noise level is manageable and you don't need to shout to be heard. My friends and I commented on how it is probably a great date spot. The service was great. The staff is extremely knowledgeable. So, if you are unsure about what you want to order, make sure to ask one of them and they'll steer you in the right direction. They are dressed in prohibition-era garb, adding to the ambiance. The front door is pretty easy to miss if you don't know what you're looking for, but there is a doorman standing outside to take your name/number. The only thing marking Death & Co is a door plaque. Overall, I recommend trying Death and Co at least once. It is a little pricey, but after you finish your experience here, you can go to a cheap place in the area if you want to continue drinking/eating. If you want to avoid super long waits, I would recommend going on a really random weeknight, early in the night, but you will probably still have to wait around 30 minutes. OH, no flash photography is allowed. They won't yell at you, but will politely ask you to never take another flash photograph in there again. And reminder again, it's CASH ONLY. Location: 433 E 6th St.